Today is my brother's birthday so first and foremost - happy 19th birthday little brother!!! My little brother and I have always been close and I'm feel very fortunate to have such a wise, dapper, awesome sibling. It seems like yesterday when he was just a little kid and we were playing in front yard during the hot Arizona summers, eventually begging my mom to take us to the respado lady. What is a respado lady? Well, first let's talk about what a raspado is - a respado is basically a super delicious Mexican icee/snow cone of sorts. It was basically the only thing that kept me from melting in the summertime. The respado lady was a woman who would sell the best respados out of her home in the small town where I spent my early years. She had tons of flavors to choose from - my personal favorite flavor was the fresa con leche, or strawberries and cream. I remember enjoying these icy treats on hot summer days with my brother while we cooled off before going back outside to play. Since Richmond has decided that summer is here to stay, I've been craving a cold and icy treat. 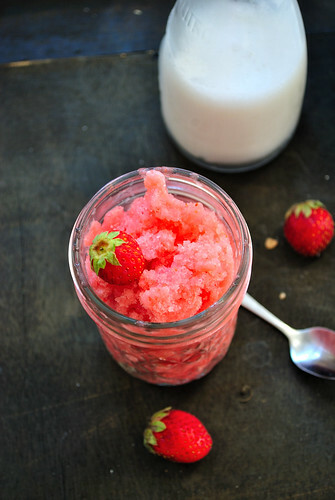 This granita takes literally seconds to whip up, is dairy-free, can be sugar-free, and makes one hell of a refreshing snack after spending a few hours outside. 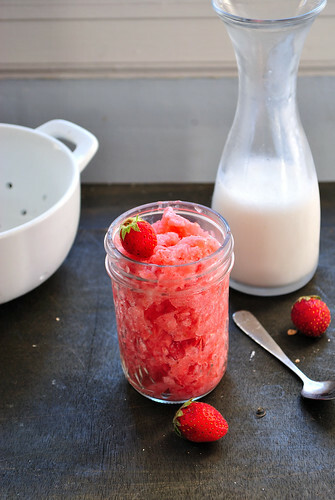 So even though I don't have a respado lady in Richmond, I can make this quick fresa con leche granita and take a little trip down memory lane. So little brother, happy birthday! Go eat a respado. 1. Purée all ingredients, besides almond milk, in blender. 2. Pour purée into a pan, swirl in almond milk, and freeze in the freezer. 3. Scrape with fork to make small icee pieces.